It's not easy to get good-quality figs in Estonia. But when you see them, you crab them straight away and make something delicious. Like this simple, yet elegant starter, for instance. The figs are from Turkey, and they were huge, beautiful, fragrant and delicious. Rinse the figs, pat dry and cut almost into quarters, leaving the base intact. Place on a serving tray, opening the figs slightly. Cut the cheese into chunks, divide between the figs. Place a piece of ham onto each fig. Drizzle with runny honey, garnish with a thyme leaf or two and grind some black pepper on top. Ma jätaksin singi ära ja sööksin ainult juustuga. Küpseid viigimarju on nii raske leida. oi jummel kui isuäratav. Need viigimarjad lausa lunivad enda söömist! I happened to come across your blog whilst perusing the internet for food blogs. So glad to have found it! This fig recipe sounds amazing!! I just started a food blog muyself - would love for you to visit when you have a chance! ja kust siis Eestis küpseid viigimarju leiab? Sõin neid mõni päev tagasi Piedmontes...mmmm. 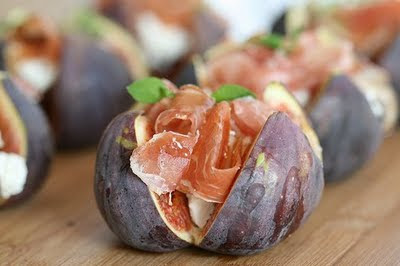 These look great-I have made figs before with goat cheese and bacon and then baked them.